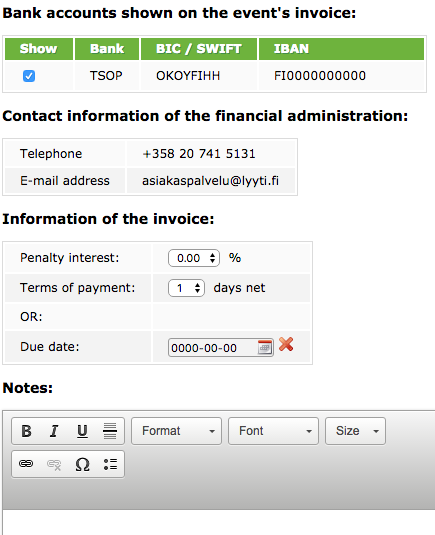 In Invoice data you can see the information to be printed on invoices. Bank account numbers and financial administration’s contact information are defined by your Lyyti user account. If you need to change these, please contact Lyyti’s customer service. You can terms of payment or a fixed due date. Text written in Notes will be printed on the invoice. 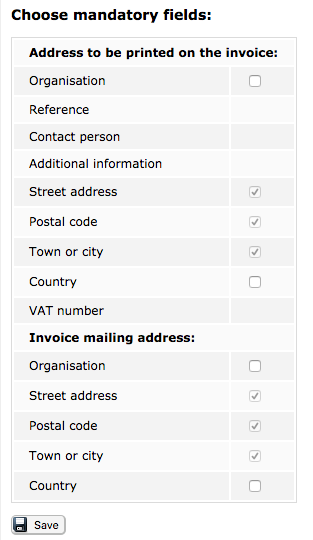 Select mandatory invoicing fields to be filled in by the participant. Street address, postal code and town or city are always mandatory, this cannot be changed. The invoicing address is always saved and can be found in each participant’s information, so there’s no need to ask for the invoicing address on the registration page.